ERIC KUHN is the chief marketing officer of Layer3 TV, the next generation cable provider currently available to consumers in Los Angeles, Dallas, Washington, D.C. and Chicago. The company is backed by the most respected names in private equity, venture capital and entertainment, including TPG, Creative Artists Agency and Paulson & Company. As a member of the startup’s founding team, Eric has built the company into four offices and 200+ people, overseeing marketing, public relations, corporate affairs and government relations. Previously, Eric was Hollywood’s first “social media agent” at United Talent Agency, one of the entertainment industry’s leading talent and literary agencies. At UTA, he represented the industry’s top writers, directors, actors and producers on their digital and social media initiatives, as well as their investments in startups. In 2009, Eric joined CNN as its first Audience Interaction Producer, leading social media and producing the first television programs that integrated digital platforms. 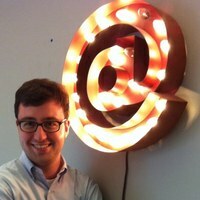 Based in Washington, DC, Eric reported and wrote extensively on technology and politics. During the 2010-midterm elections, he utilized trending topics and live Twitter feeds to report predictions of that year’s races. In 2010, Eric earned a Peabody Award for his participation in CNN’s coverage of the BP oil spill in the Gulf of Mexico. Eric also created and launched the social media strategies for the National Basketball Association (which today reaches one billion followers globally on digital platforms) and CBS News. Eric’s innovative work building bridges between entertainment and technology has been recognized by numerous publications including The New York Times, Wall Street Journal, The Guardian, Fast Company and TechCrunch. Eric has been named to Forbes’s “30 under 30” at the age of 23, Wired 100’s list of “global influencers” (2016), Hollywood Reporter’s “Next Gen Execs 35 Under 35” (2016), CableFax’s “Overachievers Under 30” (2015, 2016), Vanity Fair’s “Next Establishment List” (2011), and Variety’s “Hollywood's New Leaders” (2011). A regular speaker at conferences and universities, he recently keynoted the Abu Dhabi Media Summit, Consumer Electronics Show, DLD, Banff World Media Festival, Digital Hollywood, Business Insider’s Social Analytics, DETAIL’s Tech x Tastemakers, Variety’s Venture Capital Summit, and South By South West. A graduate of Hamilton College, Eric also studied at the London School of Economics. He serves on the board of Lincoln Center Theater, on the Emerging Leadership Council of 92Y, is a founding board member for NPR Generation Listen, on the Digital Advisory Council for the USO and on the Council for Earthjustice. Eric is an advisor to numerous startups in the media space including Niche (sold to Twitter) and This Technology, a Dynamic Ad Insertion platform for cable television (sold to Comcast).